I hadn't looked forward to a game of football this much for some time. The first leg of the F.A. Youth Cup Final had whetted an appetite for football subdued by a season of turmoil at Bramall Lane. After giving such a good account of themselves last Tuesday, bloodying the nose of Paul McGuiness' latest batch of world talent, I was looking forward to another attractive, competitive game of football and the hope (you know just a little nagging hope, the kind that you try to dismiss) that I might see the "Junior Blades" lift the F.A. Youth Cup. Driven across by my mate Simon, a Manchester United season ticket holder, roles were being reversed. Last week, Simon had sat alongside me in the heart of the Bramall Lane Kop, politely clapping all the goals and acknowledging the good football on display. This week, I had agreed to join him amongst the home fans at Old Trafford. The problem being, that I am slightly less rational than Simon. A pleasant drive across the sun soaked Snake Pass ensued, chatting about Survival Sunday, twitter and that player who couldn't be named - until 5Live news at 6pm revealed to us that he had been outed in the House of Commons. Passing through Glossop, which always struck me as the Land That Time Forgot, even the prospect of the queue up the hill at Mottram didn't dull spirits. 25 miles and nearly an hour later, we meandered our way into Manchester. Our route affected by roadworks and events across the city, you know, those once every thirty five years type events. In-car speculation ensued. Was Tevez there? Was Balotelli there? Was Balotelli's dog Lucky on-board? Eventually, some two hours after setting off, we were driving past the new home of Football Focus (Media City) and pulled into the car park at Salford Quays. Emerging from the car park and seeing the self-appointed Theatre of Dreams across the canal, in the distance. A brisk walk to the ground and after a brief meeting with my brother by the statues we headed into the ground. Drink and Hollands pie (£2.50 and still the best football pie for me) in hand we headed to our seats to find the teams on the pitch and going through the pre-match presentations. We were sat on the half way line, a third of the way back in the North Stand. To my right, the Stretford End was sparsely populated. Opposite, the Directors' Box was filling up, with a small adjacent area for guests and players' families. Then over in the left hand corner stretching out across the rear of the East Stand were some 6,000 noisy Blades fans, trying to create some atmosphere and sense of occasion. Still arriving through the early stages of the game, many encountering the traffic problems we had encountered. Balancing, pie, drink, programme and with my knees under my chin (I though nothing could beat the Bramall Lane Kop for a lack of leg room until Monday night) we sat down to watch the match. Compared to the Blitzkrieg start made by the Red Devils last week, the opening period was a cagey affair. Both teams sticking to their footballing principles, but without some of the pace and incisive play demonstrated last week. 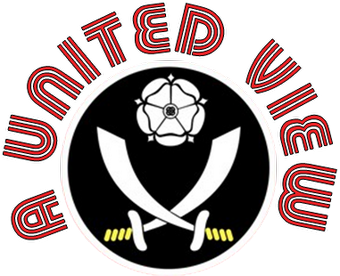 Many supporters around me were a little surprised by the manner in which the Blades played, although I bit my tongue (and not for the last time that night) when the lad you in front expressed his shock at the fact Sheffield United even had an Academy. The insularity of supporting the Champions. As the game settled down the home side took the upper hand, a mis-kick from Keane just inside the box fell fortuitously to Ravel Morrison who finished with aplomb. There then followed a period where both sides created opportunities, the more clear cut to the home side, and you sensed the next goal was vital. Towards the end of the half there was a period of prolonged pressure on the Blades goal, in amongst which Kennedy did tremendously well heading the ball clear as a shot was fired on goal. Time to bite my tongue again. There was a middle aged couple sat behind me who had wittered on for most of the half, mainly criticising Morrison prior to his goal - after which he was the best thing since Warburton's sliced, unwilling to acknowledge there were two teams making this a game. They were probably surprised to know we had an Academy as well. Following Kennedy's header, the wife commented, like me, on how well he had done. Hubby, not impressed, just replied "What? Rubbish clearance, gave the ball back to us". The scolded wife replied with "Come on, let them off, they're from Sheffield, they haven't got anything else going for them." I felt myself start to rise out of my seat, only the fact that I was in the wrong end, the match was nicely poised and I didn't fancy missing it by being thrown out and the fact that the lack of leg room had affected the circulation in my legs held me back. As someone commented later, an accidental spillage of Bovril might have been in order at half time. With the next goal vital, I was thinking "just see this out to half time, re-group and get back out doing more of the same and the Blades had a chance". A penalty right on half time changed that. We couldn't see the incident clearly from our seat and I haven't seen it since however, if it was handball, I was surprised that a card wasn't brandished in Kennedy's direction. Keane tucked away the penalty with ease and it felt like game over. The Blades started the second half brightly, but the loss of Maguire on a stretcher, who was playing particularly well alongside Kennedy, left the Blades re-shuffling the defence and I think then I acknowledged that we were as likely to concede another as we were likely to score ourselves. Pushing forward through captain Whitehouse and the hugely impressive Slew, the Blades were still creating openings without testing Johnstone. The likelihood of getting caught on the break increased and so it was no surprise that the Blades went 3 down before immediately pulling one back through Ironside. Latching on to a perfectly judged chip from Slew, he slipped it past Johnstone and kick-started a short period where the Red Devils wobbled a little. Unable to clear lines, losing out in tackles, the Blades looked likely to get another. if only they had pulled one back at 2-0, then it would have been interesting to see the home side's response. As it was, the Blades were to be undone on the break again and, although they continued to press, the fourth goal for Manchester could have been followed by more but for striker profligacy and the impressive Long in the Blades' goal. It was disappointing to see some Blades fans leaving as the fourth went in, I think the lads deserved to be applauded off by a full contingent of support at the end, although I appreciate it was a long journey across and not the shortest journey back. At the final whistle went both teams deserved rousing applause. Whilst I couldn't disagree with the home side winning, the score line flattered them. I was proud that the Blades had stuck to their footballing principles right through to the end and certainly when other teams might have adopted a more direct approach to try and claw their way back into the match. Of the Blades players on view, the central defensive partnership of Kennedy and Maguire continued to played well together (Kennedy's penalty aberration aside), until Maguire was stretchered off. Whitehouse quietened Pogba and matched up to his physical challenge much more adroitly than last week. Yet again, Slew impressed the most; holding the ball up well, before turning and accelerating away from defenders. He was unlucky with a couple of chances and set up Ironside's goal beautifully. Finally, an despite what the scoreline might suggest, Long impressed in goal. a save from a Pogba free kick sticking in the memory. For Manchester United, both Morrison and Pogba were less effective than last week. Morrison starting more advanced, rarely dropping deep and only really coming to the fore when the play was stretched and his confidence was up (post goals) later in the game. Pogba still displayed enough in glimpses to see what a quality player he could be, however it was his central defensive colleague Tunnicliffe who excelled. The driving force behind the victory he tirelessly ran, tackled and passed his way out of the middle of the park. Physically and in terms of the quality of his play, he looked like a senior pro playing with the boys. The trophy and medal presentations followed, unfortunately a vast majority of the 24,000 crowd didn't see it. Why the South Stand wasn't opened I am not sure, but if it had, a few more people other than directors and guests would have seen it. For most the hoisting of the cup could not be seen for the backs of the Manchester squad gathered on the podium and the subsequent celebration photos were then taken in an adjacent spot, again with the players facing away from the majority of the crowd. That said the home crowd disappointed me in several ways. Granted they had Blackpool and the Premier League trophy presentation the day before and Gary Neville's testimonial the day after, but at £5 adults and £1 kids you would have thought the world's biggest club could have generated more than 17,000 fans. I accept when you are Manchester United you have bigger things going on and, unlike the Blades (A Fourth Division Championship, Third Division Runner Up, twice runner up in the Championship (or equivalent) in my lifetime), the possibility of your club winning a trophy has less resonance. But those who didn't come along really missed out. The other thing was that a large proportion of those who did stay left prior to and just after the presentation, before their team had paraded the trophy in front of them. I can never understand that. Having said that the FA and or their club made a decision to exclude them from the trophy presentation, so maybe you cannot can blame them in this instance? The final thing was that I am sure I heard a few boos as the Blades players went up to collect their medals, I hope I was wrong. So ended what will probably be my last trip to Old Trafford for a few years. A decent match, good company on the trip, a good pie, a few irritants (but every ground and even your own support can supply those) and an over-arching sense of pride in what my team had achieved. The Academy class of 2011 in one half of Manchester and one half of Sheffield have graduated with honours, but how many of them will go on to forge a successful career? wow its a time to change dreams in reality.